Purse - Rebecca Minkoff "Swing"
Happy Cyber Monday, friends! When oNecklace contacted me again to showcase new jewelry, I eagerly said yes, as the last item I received from them (seen here) is something I wear almost daily! 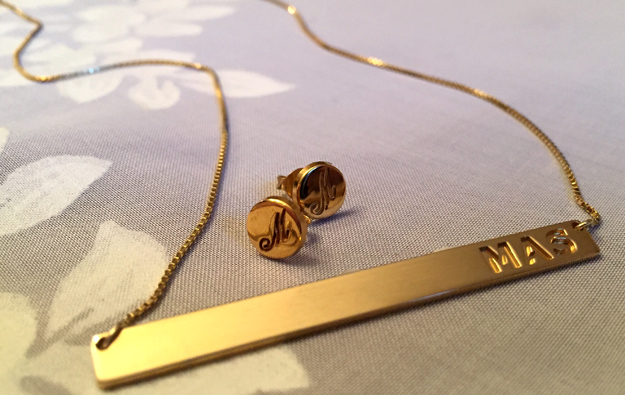 Since I love necklaces, I decided to try a different style and chose this 24k gold plated bar necklace. It comes with the engraving blackened by ink, but I requested the letters be left plain. The 24k gold plated earrings are so light and comfortable that I forget I'm wearing them. Both of the items I chose also come in sterling silver, and readers can save 10% by entering code dapper10 at checkout. Additionally, I'm loving this fun Dior nail polish acquired during the Sephora VIB event a few weeks ago. Hard to describe, and changing with the light, it's a metallic combination of gold, champagne, silver and gray, with a bit of rose mixed in. Last but not least, how great are these boots? I found them marked for $28 at a consignment shop, and with my account credit, I paid under $3 out of pocket. They retailed for $400 new! Thanks so much for dropping by today and happy shopping! The jewelry pieces you selected are really pretty. I like the delicate necklace very much! I love your blouse! Such a pretty color! I too ordered this necklace with the initials non blackened. Very nice quality. Have enjoyed wearing it.